SPONSORED: Making a tough subject memorable and meaningful is all about asking the right questions. For more than 20 years, BP has been recognizing Alaska's exceptional teachers — like Christopher Benshoof — through the BP Teachers of Excellence program. Since 1995, the company has honored nearly 700 educators for their dedication to teaching and inspiring students. Nominations for this year's awards are open until Feb. 1; the program is also accepting submissions for the new Educational Allies Award, which celebrates the unsung heroes in Alaska's schools, such as principals, teaching assistants and other staff members. The Golden Heart City has held a place in Christopher Benshoof's heart for as long as he can remember. He grew up attending schools in the area, and after graduating from Lathrop High School in 2001, he went on to pursue a degree from the University of Alaska Fairbanks. "I never left, I guess," Benshoof said. "I love living here in Fairbanks." 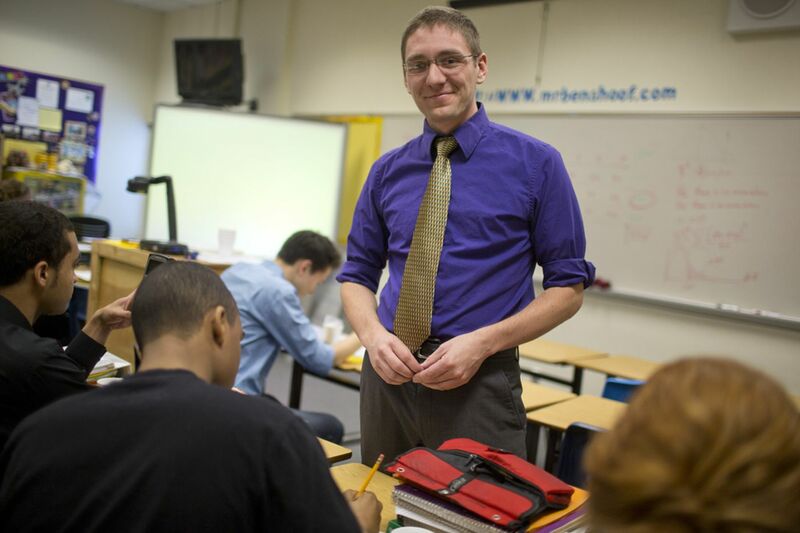 2012 BP Teachers of Excellence Award winner Christopher Benshoof, of Lathrop High School in Fairbanks, hopes to inspire his students in math the way he was, when he attended more than 15 years ago. Photo courtesy BP. Benshoof received a BP Teachers of Excellence award in 2012. It was followed by more honors. In 2013, he was named Alaska Teacher of the Year, and in 2016 he was honored with a Presidential Award for Excellence in Mathematics and Science Training. His secret? An Alaska-grown zeal for learning. "I have a big enthusiasm for the subject," he said. "I think it carries over to the students on a daily basis." At UAF, Benshoof earned a bachelor of science degree in mathematics and a master of education degree in curriculum and instruction. At Lathrop, he teaches everything from Algebra 1 to pre-calculus, Advanced Placement statistics, computer science and engineering classes. His days are packed with students and classes and extracurricular activities and homework. They start at 7 a.m. Students begin arriving around 8 a.m., and over the course of the 7-hour school day, Benshoof leads three math courses and three engineering courses, teaching approximately 120 kids. They tackle projects designed to spark their imaginations and pique their curiosity — like the time Benshoof's AP statistics class used matchsticks to simulate a forest fire, applying their newfound statistical skills to determine which "houses" had the highest probability of burning. In the afternoons, depending on the day, he'll either be coaching cross-country running; supervising academic decathlon or Lathrop's FTC Robotics team; leading an unpaid, extracurricular AP art history class; or catching up on coursework for the Ph.D. he's pursuing in education. Benshoof's schedule is lively and varied, but the goal is always the same. "I like finding new ways to help kids connect and find success," he said. "Teaching them new ways to solve problems is a lot of fun." In AP statistics, he enjoys broadening his students' horizons. Lessons in subjects like experimental design, confidence intervals and hypothesis testing provide "multiple lenses" through which they can view the world. In the computer sciences class, he relishes showing his students how to harness the power of technology. The Lathrop High School engineering program was among the early Science, Technology, Engineering and Math (STEM) programs in the state. BP supports similar STEM programs, such as summer engineering academies at the University of Alaska Anchorage (UAA), the Alaska Native Science and Engineering Program (ANSEP), FIRST Robotics, and the Alaska Process Industry Careers Consortium (APICC), along with school district career and technical education programs. While the many professional awards and accolades are humbling, Benshoof said, he measures success by the looks on his students' faces at the end of class, their passion for the subjects and the ways they use the things they've learned. "If kids are smiling and having a good time, and if I'm smiling and having a good time, I know we're going in the right direction," he said. "I think my greatest successes are when kids are able to apply what they've learned in class in new ways." For many kids, parents and teachers, turning a math lesson into a good time is a daunting task. Benshoof accomplishes it by identifying students' individual struggles and finding creative ways to master them. Often that means learning how to ask the right questions, he said. Sometimes it means head-down study time; other times, it means hands-on lessons filled with active learning, like simulating wildfires in a forest made of matchsticks. Or building a robot. "And kids are excited about that kind of thing," Benshoof said. "I think there are a lot of opportunities in every class." He draws inspiration from the rich, experienced educational community around him. Without the support and guidance of other Lathrop teachers, Benshoof said, he wouldn't be anywhere close to where he is today. As a teenager, Lathrop teachers helped stoke his love of learning. Now that Benshoof is one of them, he says, they still keep him at the top of his game. "The Lathrop community's been amazingly supportive," he said. "It's a very professional group of people who are always looking for ways to help each other out." Benshoof said that's the biggest piece of advice he can offer his fellow educators: Seek guidance from the people around you. "The best thing new teachers can do is take advantage of the wealth of knowledge in their colleagues. I have found that without exception, teachers are great at sharing what they do with other teachers," he said. "It really is the thing that's made me a good teacher." While the state of Alaska's economy is uncertain, Benshoof says he stays focused on his goal: Continue to teach, and continue to provide as many good opportunities as possible for Lathrop students. It's been 15-plus years since Benshoof first walked through the doors of Lathrop High School, but it's still the first place he wants to be. This article was produced by the creative services department of Alaska Dispatch News in collaboration with BP. Contact the creative services editor, Jamie Gonzales, at jgonzales@alaskadispatch.com. The ADN newsroom was not involved in its production.